Pattern Play with Pens: Weekly Challenge No. 9 "Artoo"
Weekly Challenge No. 9 "Artoo"
The diva has made a new tangle pattern in honor of her son. The pattern is called "Artoo" and we are to use it in this weeks challenge. 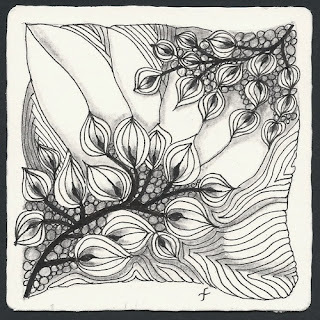 I hope my zentangle is worthy of such a great little guy who has fought the good fight- victoriously. Joni, this tile is very beautiful! Love the new tangle and the way you used it! Joni this is a lovely tile, I love the way each sections plays off the other. I can hardly wait to try Artoo! This one speaks to me. How full of life. Now this is perfectly gorgeous! Beautiful tile. I like the little black "seed" in each! Nice shading too. Great use of the new tangle Joni- I like how you balanced the zentangle with Artoo on both sides - Wonderful!!! Your tangle is DEFINITELY worthy - and quite stunning, to boot! Funny girl, it is a delightful Zentangle. I really like the way the two sprigs are growing to meet each other! Absolutely worthy! I love the flowing organic feel to it! Great job! wonderful outcome , this tangle and for Artoo !! I love the wonderful movement in this tangle. It's just beautiful. A beautiful piece. Love how it approaches from opposite corners. Wonderful use of white space within the design. Beautiful! I am loving this Artoo pattern, tho have yet to join in the challenge. Wonderful treatment of it. Will have to stop lurking around and join in one day! This is very nice, Joni. I too love the little seed in each pod. Beautiful. It flows very nicely. I love it, when a drawing prompt a song. The image becomes so multi-dimensional when this happens. And here it did! !